Printed circuit boards are the basis of electronic sub-assemblies. They are electronic circuits, often complex, with the thin layers of tracking printed onto thin, non-conductive layers. Components such as resistors, capacitors, semi-conductors, mounts for processing chips and memory chips, etc. are added in subsequent operations. Modern electronic equipment demands a very high tracking density which is achieved in “multilayers” or “multilayer boards (MLBs)” where multiple conductive layers (cores) are separated by insulating layers called prepregs. A further development of this technique is the HDI (high density interconnect) board. Processing is a complicated set of individual operations and will vary to produce any specific design of board. Over 40 activity stages may be used in the production of boards, although not all of them will be used for any board design. In general, the base materials are phenolic paper, epoxy paper or epoxy glass laminates. For special applications, ceramic materials, flexible or flex-rigid materials are used. The base material is clad with copper on one or both sides, with a thickness usually between 5 and 105 μm, depending on design requirements. Metals other than copper may be occasionally used for specific applications, such as aerospace. 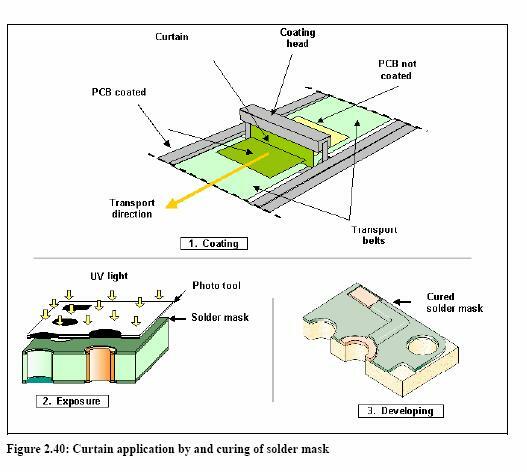 Examples of the construction of PCBs are shown in Figure 2.27. The cores are laminated with preregs, with copper foil outer layers. 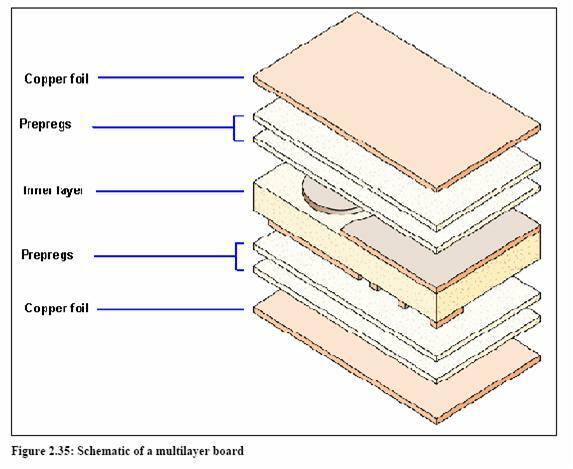 The cores and the copper foil are patterned and processes in similar ways, and some stages may be repeated to complete a complex multilayer board. Over 90% of European production is made by a subtractive method, where copper is removed from the base layer to leave the conducting track, called a connect. Additive or semi-additive processes, which lay down a conductive track are not used often, and are not described. 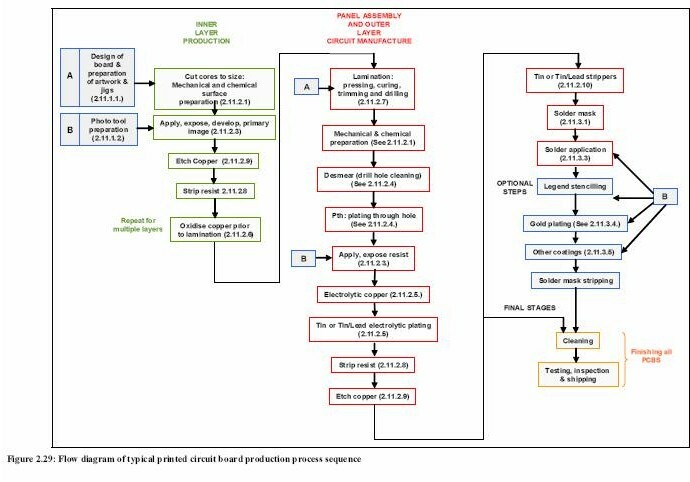 The following Figure 2.28 shows the production steps involved in creating a typical multilayer board, as shown in Figure 2.35. The overall process is complicated, with many of the steps being repeated. 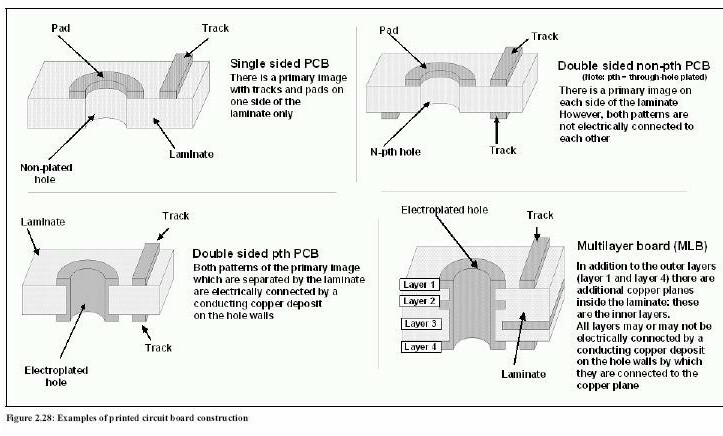 The diagram shows first the ancillary operations essential to all PCB manufacture, such as production of the design and preparation of phototools. The inner layers are created, assembled and the outer layers created around them. The holes may be plated on the inside (known as through-hole plating, abbreviated to “pth”) to provide a connection between layers, see Figure 2.28. Non-plated holes are referred to as non-pth. The printed circuit design is normally developed on CAD software, including reference marks such as locating holes for jigs to hold the board during the various processes such as drilling. The design is transferred to an artwork template called a photo tool. There are two ways of applying a design to a PCB: screen printing or photo-printing. Photo tools are used in both processes and are made of polyester, or, for extremely high dimensional stability and accuracy, glass. The images are either dia positive (the tracking is shown as a positive image) or dia negative (the tracking is shown as a negative image). The photo tools are coated with solver-halide emulsion produced by two techniques, although the photo technique or photo plotting have largely replaced screen printing technology. Photo plotting uses laser plotters with high resolution to trace the design onto the film with an accuracy of up to 15 μm for trace and space. A development and fixation process follows in a continuous horizontal line. Screen printing is based on the well-known printing technique. An ink-permeable screen is stretched on a frame, degreased, rinsed and dried. A photo-sensitive emulsion based on a silver halide and polyvinyl alcohol/acetate is applied and dried. The film is cured with ammonium hydrogen dichromate. The image is applied and developed. If the screens are used again, they are cleaned by an oxidative cleaning process using stripping solutions such as enzymes, sodium hydpochlorite, and periodate. Residues may be removed using toluene, xylene or butyl acetate. Due to higher resolution requirements for the track pattern, the screen printing process is increasingly losing its importance against the photo printing process. Prior to the application of the photo resist, the blank laminate has to be cut or punched to size, and preliminary holes drilled for locating and initial contact through the board. The laminate is cleaned to remove the corroded copper surface. A pre-cleaning process provides a clean face for subsequent treatments, but for PCBs a level surface is also essential for the high-accuracy circuitry. The cleaning processes are typically set up sequentially in horizontal continuous production lines. The copper surface is initially cleaned with NaOH or a mixture of tensides and acids (H3PO4). This is followed by three further processes. Brushing stations then roughen the board surface with roller brushes of bristles or non-woven abrasives under a water spray to wash away the abraded copper. Bristles can also be nickel silver or bronze. Problems caused by uneven wear can be overcome by oscillating rollers. The surface roughness should be between 1.5 and 2.5 μm. The subsequent adhesion of dry or liquid resists depends on the number of grooves and pores per surface unit. The surface is subsequently cleaned (usually on a conveyor system) by spraying in a rinsing cascade. An inert pumice (SiO2 72%, Al2O3 13.0%, K2O 3.2%, Na2O 3.5% (unknown 7.3%) is sprayed at high preddure to restructure the copper surface to a surface roughness of Rz = 1.6 to 1.9 μm, rather than to remove copper. Following this treatment the surface is rinsed under high pressure (10 bar) and subsequently dried. This is spray etching using either copper chloride or a pickle of an acid sodium persulphate, and for very thin inner cores, is the preferred method, as no mechanical damage of the cores should occur. The persulphate pickle consists of approximately 100 ml/l sulphuric acid and between 70 and 120 g/l sodium persulphate. During the microetch process, the copper value rises continuously. The performance of the etchant is reduced as soon as the concentration exceeds a value of approximately 30 g/l and the solution has to be prepared afresh. During a batch process, the concentrate is either precipitated as copper hydroxide slurry in an alkaline solution, pressed out and discarded as waste, or is recycled electrolytically. The surface is rinsed in a cascade followed by a drying process. Excess water is removed from the boards by squeegee rollers, and then residual humidity is evaporated by an almost pressure-less preheated airflow. In modern high density boards, holes are to be drilled as small as possible, often below 0.5 mm. NC controlled single spindle machines are used, but are increasingly replaced by the CNC/DNC controlled multi-spindle machines, as well as laser and the X-ray drilling machines used to generate very high hole densities for HDI technology. Multi-spindle CNC drilling machines have table constructions which are extremely warp-resistant, relatively light and in addition fast to accelerate and to position. Spindles with air bearings can achieve more than 100000 rpm with individually controlled Z-axis modules. Inner layers for MLBs may be either structured by screen printing or by dry resist (dry film). The pattern of the outer layers is generally structured by dry resist. In isolated cases, a third process, screen printing, may be used. For photo-printing the three process steps are coating (liquid or dry), exposure and developing. These process steps may be automated and conducted in a continuous process. During the first step, the pretreated surface is coated with a photosensitive layer (photo resist) which is available either as liquid or as dry resist. For the coating, two different important processes are available: roller coating for liquid resists and lamination for dry resists. Table 2.3 shows the advantages and the disadvantages of both systems. Roller coating (liquid resist). The liquid resist consists of acrylates, photo-initiators and fillers and is dispensed through a metering gap and spread under pressure by a corrugated rubber roller onto the surface of the laminate. Because of the corrugation of the roller, the contact pressure and the solid content of the liquid resist, the coating thickness is adjusted to a thickness of between 2 to 12 μm. The resist is continuously filtered and monitored in its viscosity while being circulated through a storage tank. The condition of the rollers is important as damaged rollers produce defective coatings. The inner layers are coated on both sides and then dried with on-line infrared driers. The losses occur only during the cleaning or when changing the resist. 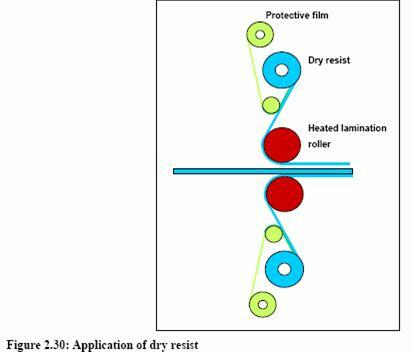 Lamination (dry resist) (Figure 2.30). 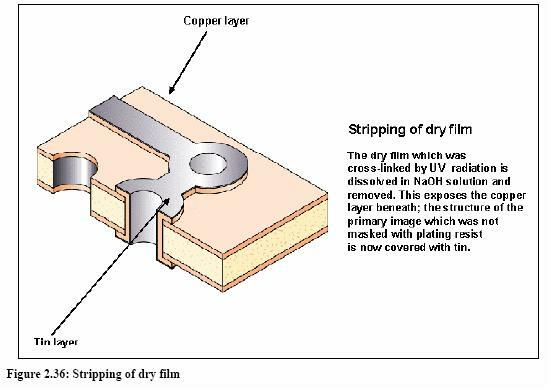 Dry resists are structured in several layers. In clean room conditions with only yellow light, the photo sensible emulsion is applied by curtain coating on a polyester carrier foil of 25 μm thickness, dried and covered with a polyethylene protective layer. This sandwich can be rolled onto a paper or a plastic roll core from which it is laminated to the surface of the inner layer. Either manual or fully automatic laminators are used, the centre core of which is the roller system. Principal factors influencing the process are: laminating rollers with an aluminium core to maintain dimensional stability, temperature, contact pressure, waviness of the laminate surface, laminating speed and the pretreatment method of the copper surface. The image is photo-printed onto either type of photo resist – either manually or automatically – in imaging equipment in clean rooms under amber light conditions. In Figure 2.30, the photo tool is exposed to UV light which passes through the transparent areas of the photo tool, and polymerises the monomer components of the resist by cross-linking. The resulting polymer is resistant to the following development process. The laminate (resist) is developed by spraying with a sodium carbonate solution while passing along horizontal continuous line. This step exposes the final track pattern (tracks, pads with holes, pads for SMDs (surface mount device) and ground planes for the following process (Figure 2.32). The typical development line consists of the main development chamber, followed by a smaller chamber(s) with fresh sodium carbonate supply. This enables the panel surface to be rinsed with clean development solution, reducing the dra-out of contaminatd solution into the following fresh water rinsing zone. The development chamber may be equipped for the first 60% with cone nozzles and for the remainder with fan jet nozzles. The manifolds are equipped with an oscillation to bridge the mechanical effect of the spray nozzles and a better exchange of solution. The fan jet nozzles are to eb installed at an angle of approximately 30 – 40° transverse to the direction of the process. In case of multiple nozzle bars, these may be installed against each other. In isolated cases non-pth PCBs are still manufactured using screen printing technology. The copper surface of the panel is finished; although further processing with solder mask can follow. Screen printing inks may be removed either by solvents or sodium hydroxide solution. Plating through the holes provides electrically conductive connections between the conductor tracking planes on both sides of a double sided board or between the multiple tracking planes of MLBs. There are usually three stages, desmearing, activation and electroless (autocatalytic) copper plating. However, there is a tendency to replace autocatalytic copper by direct plating. Note: do not confuse this process with through hole construction, which is a type of PCB construction where the wired of components are placed through holes drilled through the board. This has now largely been superseded by surface mounted components. The high drilling and advance speeds cause the drill bits to heat up, causing the drilled polymer residues to smear as films in the barrel of the holes. It is essential to remove these residues or there will be poor adhesion of the metal layer to be deposited. Remaining residues may also lead to later problems by vaporising during the soldering process (out-gassing). The etch-back process using concentrated sulphuric acid (96%) is being superseded by the permanganate process. A plasma etch process exists but is rarely used. 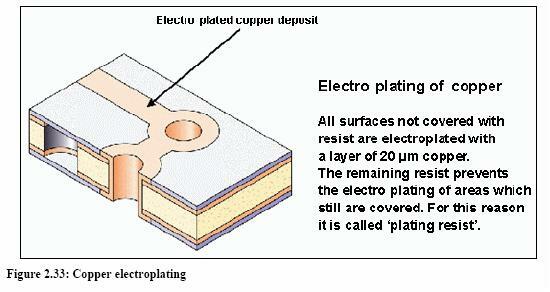 In direct plating, a conductive polymer layer is applied instead of a copper layer. 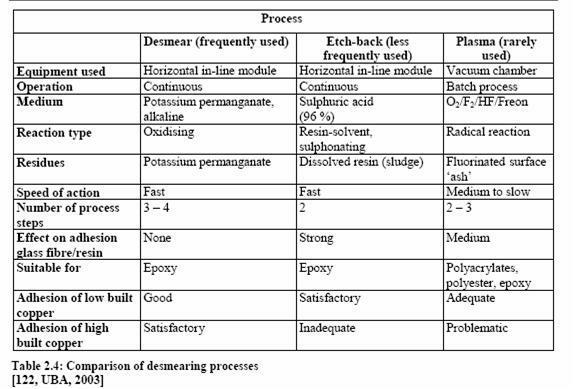 The usual processes are based on either polymer-carbon or palladium deposition. During the first process steps (conditioning with subsequent oxidation with potassium permanganate) manganese dioxide is formed. Manganese dioxide reacts with a monomer compound (a thiophene derivate) during catalysis. In the fixing bath, the sulphuric acid causes the monomer compound and manganese dioxide to react to form a conductive polymer layer. This layer serves as a conductive layer during the subsequent electrolytic copper plating process. The panels that so far have been processes either by screen or by photo printing are now treated to eliminate any residues of grease, finger prints, etc. They are first pre-cleaned in acidic, in alkaline or in neutral solutions. The open copper surface (conductive pattern) is then deoxidised wither with sodium persulphate solutions or sulphuric acid/hydrogen peroxide solutions. Between 0.5 and 1 μm copper are removed. The copper surface is finally acid dipped to provide a freshly activated surface for plating. Generally, the primary image is built up by a minimum of 20 μm on top of the base copper surface where the surface is not protected by the plating resist, see Figure 2.33 (proportionately less within the barrel of the holes). 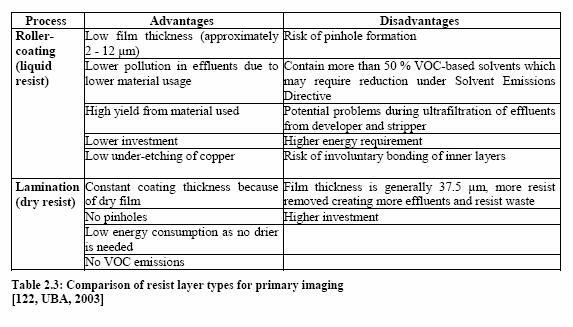 In order to protect the electroplated primary image against the attack of etching media the copper surface is covered with a tin layer (Figure 2.34). Contact fingers for plug connectors are frequently gold plated. In rare cases, they are finished with rhodium, ruthenium or palladium. Oxide processes have been commonly used and are described below. However, other processes are now emerging (sometimes referred to as oxide treatments). One type creates a copper azole complex at the surface. Developments of these processes are rapid and driven by ever-increasing higher technical requirements. Effluents can be minimised by ensuring the concentration of the individual components is maintained by additions equalling the evaporation rate. Thorough rinsing is necessary after the process. Both the laminates and the insulating layers (the prepregs) have to be bonded strongly and suing oxidised copper surfaces prevents delamination of the finished board. The pre-oxidised cores of the multilayer are laminated with bonding sheets (prepregs) and copper foil (outer layers). The prepregs are shaped sheets of pre-polymerised epoxy resin reinforced with glass fibre. They liquefy under the influence of pressure and temperature and bond with the inner cores. 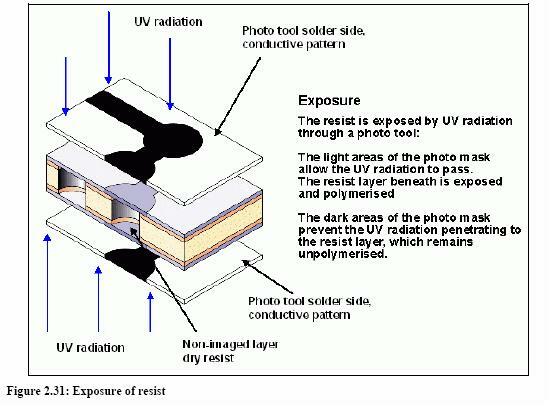 After electroplating, the photo resist film has served its purpose of defining the circuit image and is, therefore, completely removed from the board surfaces. Resist strippers are designed to strip fully both aqueous dry film and liquid photo resists. The resist strippers have been formulated in order to remove the resist rapidly without attacking the copper or the tin/tin-lead. Controlled swell characteristics minimise lock in between fine tracks. with organic additives such as butyl glycol or butyl diglycol, although in Germany systems are often run without organic additives. 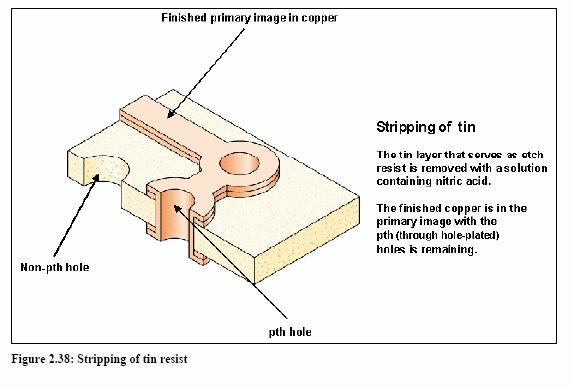 Etching is undertaken to completely remove the base copper thus leaving only the circuit pattern which is protected by the tin/tin-lead deposit (etch resist), see Figure 2.37. Typically, modern etchants will remove copper at 5 to 50 microns per minute at 50°C. The type of etchant used, the equipment in which it is used and the rate of etch is of great importance, as they all influence the amount of undercut that occurs. 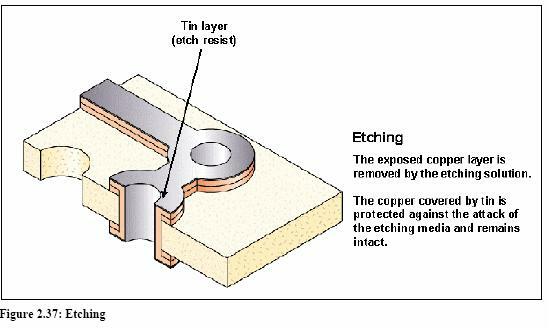 The undercut us where copper is dissolved from beneath the metal etch resist, producing an overhang of the metal resist. Ventilation is likely to be required to remove ammonia and achieve a comfortable work environment, as well as meeting health and safety requirements. A controlled balance is necessary. Excessive ventilation will reduce pH and ammonia levels; insufficient ventilation will allow excessive fumes and an increase in pH and ammonia. Ideally, the ventilation should be dedicated to the etch line only. After the stripping of the etch resist, the unprotected copper surfaces on the PCBs needs protection from corrosion, and from solder bridging (solder making unwanted connections between tracks) during the soldering process when components are added to the board. All copper portions which are not required in the assembly process are covered with an insulating resin matrix (see Figures 2.39 and 2.40). Several methods are available, the most important ones being screen printing and curtain coating. The difference in screen printing is that a solder mask is applied. However this technique is not normally used for high volume production. Curtain coating is more efficient and used for high production volumes. The panels are passed on a horizontal belt (at approximately 20 m/min) through a curtain of solder mask. After it is tack cured it is exposed through a photo stencil (similarly to etch resist). As in developing etch resist, the non-exposed surfaces are selectively stripped in a developer solution of sodium carbonate or ethyl glycol: aqueous alkaline masks are increasingly used. The panels are then rinsed, dried and cured in line. There are several surface finishes: Hot Air Solder Level (HASL), Organic Solderability Preservative (OSP), Electroless Nickel Immersion Gold (ENIG), Immersion Silver (ImmAg), Immersion tin (ImmSn), Reflowed Tin/Lead, Electrolytic Nickel Gold, and Electroless Palladium. The selection of which steps are applied depends on specifications and subsequent process requirements. As this industry develops rapidly, further information can be found on industry websites. 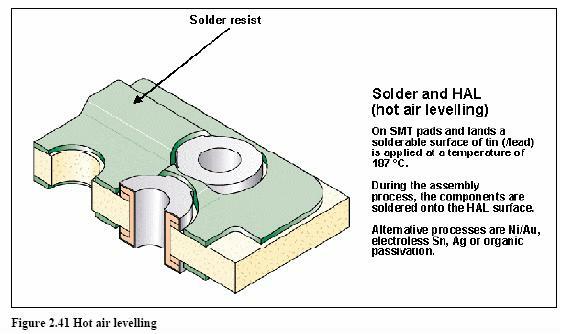 The application of a solder mask leaves areas (called pads and lands) for the surface mounting of the components. 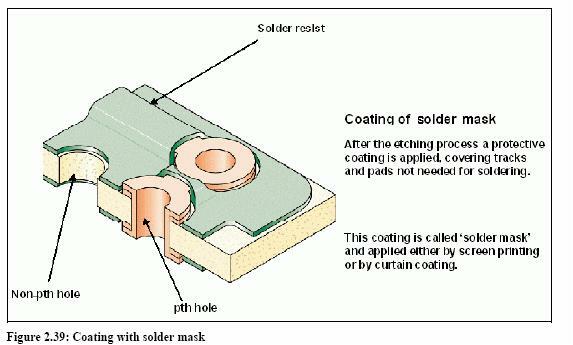 These surfaces need protecting, usually by Ni/Au, if the soldering of components is not carried out immediately. This is also called Hot Air Levelling (HAL) or Hot Air Levelling (HASL). After pre-cleaning (degreasing, deoxidation and drying), the boards are immersed in a flux (rosin) bath, followed by dipping in a eutectic tin-lead bath at approximately 240°C. The molten tin-lead is blown out of the holes under high pressure. This hot air knife levels the tin-lead deposit, with a thickness of about 1 – 25 μm, as in Figure 2.41. The boards are rinsed and dried. After surface preparations, a layer of electroless nickel is applied, followed by an immersion gold coating. Organic passivations are increasingly used on horizontal moving lines. A protective layer of 0.2 – 0.3 μm is deposited out of a solution of acetic acid, imidazole derivates and ammonium compounds. This layer is removed by a flux immediately prior to the soldering process. The plating racks and plating baskets must be regularly stripped of metal build-up. Carriers used in electroless copper plating are usually stripped in sodium persulphate solutions. Metal carriers which have been electroplated with copper and tin are stripped chemically, very often with nitric or in an anodic process. Stamping 60-80 °C printed circuit board continious Risse, A. (2012). Leiterplattentechnologie. In Fertigungsverfahren der Mechatronik, Feinwerk- und Präzisionsgerätetechnik. Springer Berlin Heidelberg. manufacturing the inner layers: This area is changing rapidly, with technological advances driving customer specifications. Use techniques with low environmental impact, such as alternative techniques to oxide bonding. alkali etching: Monitor the level of etchant and copper regularly and maintain an optimum concentration. For ammonia etching, regenerate the etching solution and recover the copper. resist stripping: Separate the resist from the effluent by filtration, centrifuge or ultrafiltration according to the size of the flow. stripping of the etch (tin) resist: Collect rinsing waters and concentrate separately.Precipitate the tin-rich sludge and send for external recovery. black or brown oxide process for inner layers . This page was last modified on 1 September 2016, at 11:42.